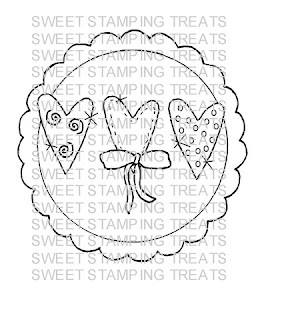 Welcome to SST"s "Dollar Digi Sale" for January 2012 This Digital stamp "Hearth Circle" will be available for $1 for the next month so hurry on over and get your copy today! For my card I printed the image so it measured approximately 3 inches across, colored it with Bic Mark-it pens used some white stickles and silver liquid pearls to give it some bling cut it out pierced hols in the scalloped edge for a lacy effect. I went through my hugs stash of 'scrap' paper and pulled out some fun colorful prints and solids inked all the edges with light brown chalk ink added some satin ribbon pink rhinestone hearts and stamped it with an acrylic ($1) stamp by "G" studios and we are done!! Hope you like my little project. 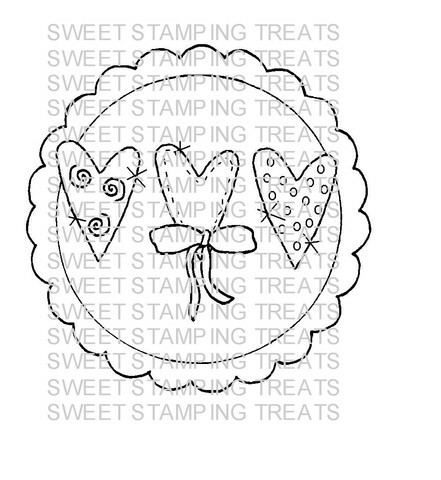 Now head on over to Sweet Stamping Treats to see more projects with this months $1 digi!